AQUATIC APE THEORY: The aquatic ape theory can explain how we came to have such features as long hair, protruding noses, and naked skin. And now I have found the island where it could have happened. Paleoanthropology, the study of human evolution, is a sub-discipline of paleontology, the study of fossils. Hair, skin, fat, and sweat are not preserved as fossils. For that reason, paleoanthropologists have not allowed those things in their discussions. Allan Krill has written a history on the rejection of continental drift, available for free open access at krilldrift.com. The rejection of the aquatic ape theory is quite similar: once again, fossil experts are rejecting a seemingly outlandish theory of evolution, not continental evolution this time, but human evolution, even though the theory is capable of explaining most of the important features, including features that textbooks avoid mentioning. It’s like the sport of basketball, where ropes, gloves, grease, and water are not allowed in the game. If they were now to be allowed, basketball courts would need rebuilding and the current basketball stars would not have the appropriate skills to play. In science we would call such a change a paradigm shift. Human hair, skin, fat, and sweat inspired the idea that the ancestors of humans were semiaquatic during an unknown period of their evolution. It was proposed by the marine zoologist Alister Hardy in New Scientist in 1960. In The Naked Ape in 1967, Desmond Morris added more arguments in support of it. Elaine Morgan researched and wrote several books on it, including the bestseller Descent of Woman (1972) and The Aquatic Ape (1982). Since Morgan’s last book in 2008, the theory has been treading water, so to speak. It was given some fresh publicity by naturalist David Attenborough in two BBC radio programs in September 2016. 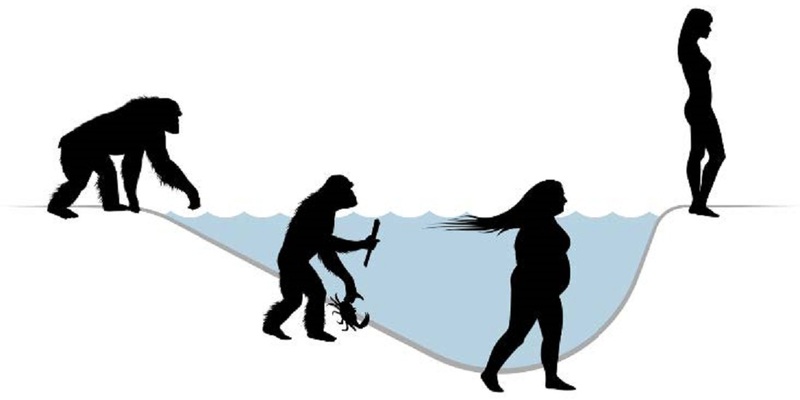 Textbooks on human evolution have been either ignoring or ridiculing the aquatic ape theory for the past 50 years. Nevertheless, it might be valid. We should not forget that textbooks on geology ignored or ridiculed the theory of continental drift for about 50 years, before it suddenly became part of the new paradigm of plate tectonics. The aquatic ape theory has been disregarded because there is no fossil evidence that can prove it or disprove it. But fossils of apes rarely give us clear answers about evolution, because they are extremely rare. How rare? Consider the chimpanzee and the gorilla. There are currently a few hundred thousand of them living in Africa, and these species have lived on Earth for several million years. Yet, only one fossil of either of these species has ever been reported: 3 teeth from a chimpanzee. Fossils of extinct apes, mostly fragments and none of them complete, have been given names such as Java Man, Homo erectus, Piltdown Man, Taung Child, Australopithecus, Homo habilis, Lucy, Lucy’s Baby, and Turkana Boy. There is great uncertainty and disagreement as to how they are related to each other. But paleoanthropologists have believed that they were the ancestors of humans. Such claims have advanced the academic careers of scientists, helped argue against creationism, and satisfied the educated public. But the scientific evidence is too scanty and too irreproducible to verify these claims. These apes may be unrelated to each other and to humans. The fossils of these early extinct apes do not show human-size brains, as the later fossils of Homo sapiens and Homo neanderthalensis do. Nor is there a clear progression in brain size, or other features among the early fossils. It is thought that brain size increase and the other characteristic human features evolved separately and gradually over a few million years, while our ancestors were living in widely separated places, mostly in eastern and southern Africa. But what could have caused them to evolve so dramatically? Why have none of the other 260 species of living primates evolved large brains, or become bipedal, or given up their fur? The aquatic ape theory has not succeeded, partly because its advocates have been trying to make the theory work for the evolution of those early apes, which I think are unrelated. In my version, the species Homo sapiens evolved directly from Pan troglodytes, the common chimpanzee. The speciation happened quickly and recently, and no other ape ancestors were involved. In my version, the species Homo sapiens evolved directly from Pan troglodytes, the common chimpanzee. Modern genetics shows that the chimpanzee is remarkably similar to the human. It is an open secret that they could produce a hybrid offspring, a humanzee. The ancestor of humans must have resembled the chimpanzee, just like the ancestor of domestic dogs must have resembled the grey wolf. In the case of dog breeds, it was humans who provided the selection pressures that caused such striking physical differences. In my theory of semiaquatic humans, the selection pressures involved an exclusively marine diet and the unique challenges of aquatic survival. The article continues under the picture. I imagine that the first step, or misstep, toward human speciation took place on an unlucky day for a single female chimpanzee, whom I call Chimp Eve. Like other chimpanzees in the wild, she could not swim, but suddenly she found herself floating down a river clinging to some branches. She was swept out to sea, and several days later became stranded on the island Bioko. Evolution of a new species by isolation is called peripatric speciation, and the isolated individual is called a founder. Bioko is a steep and high volcanic island, quite unlike the low-lying forests of nearby Africa. It seems to be unsuitable for chimpanzees, because none live there now, nor have lived there in historic times. Bioko’s coastline is about 90 percent rocky and 10 percent beach. On the steep rocky shore where Eve presumably landed, there were none of her familiar foods: fruits, nuts, leaves, flowers, insects, and small animals. She was weak and starving, but she saw a crab walking in a tide pool, and knew that must be food. She soon discovered other seafoods such as mussels, sea snails, and sea urchins, and she never ventured higher up into Bioko’s unfamiliar territory. Eve was pregnant and gave birth to Chimp Adam. Their subsequent offspring and descendants thought that food came only from the sea. Because of inbreeding within the Founderchimp family, curious mutations got passed on, such as the fused chromosome 2 of modern humans. Mutations that increased chances of survival in the sea were also passed on. The infant mortality rate must have been high, since baby chimpanzees were not well suited to semiaquatic life. Bioko has a two-meter tidal range. To gather food at low tide was easy. At high tide, it required wading in the water. When modern chimpanzees wade, they walk on two legs and stand as upright as possible, to keep their faces above the surface. Over time, the bones, cartilage, and ligaments of these semiaquatic chimpanzees evolved, making upright posture and bipedal wading more effective. They often held tools for prying loose shellfish or cracking them open. When they came out of the water, still holding a crab and a tool, it was natural to continue walking on two legs. They could even try running on the beach, just for fun. Bioko has no leopards, hyenas, or other large predators, so it was not risky to practice there, as it would have been on mainland Africa. It may have taken a few thousand years before their bodies were adapted enough for them to be good bipedal runners. Each of the differences between modern humans and chimpanzees can be used to test the semiaquatic theory. For the differences that I am aware of, the theory succeeds beautifully. Large brain. Human brains are triple the size of chimpanzee brains. The brain is about 60% fat, and a diet with DHA and other omega-3 and omega-6 fatty acids is necessary for brain growth. A marine diet is the richest source of these essential fatty acids. The other mammal with a famously large brain is the dolphin. Fossils show that human brains have gotten a little smaller since the days of the early Homo sapiens. We no longer live solely on a marine diet. Friendly teeth. Chimpanzees have long jaws and long frightening canine teeth. Humans have a short jaw with short canine teeth. This dentition is suitable for soft chewy marine foods, and no need to threaten enemies. Protruding nose. The human nose prevents water from being pressed into the nostrils during swimming and diving. The chimpanzee nostrils are exposed. The proboscis monkey, with its human-like nose, is the most aquatic living primate. Long legs. Modern humans and Homo sapiens fossils are about 30% taller than chimpanzees, and have longer legs than arms. Evolution of longer legs allowed semiaquatic humans to stand in deeper water. Naked skin. Fur helps protect skin from sun, but has disadvantages in water. All naked mammals, except an underground mole-rat, are aquatic or semiaquatic, or presumably had semiaquatic ancestors. The naked dolphin and manatee are fully aquatic. The hippopotamus is semiaquatic, even mating and giving birth in water. The elephant, rhinoceros, and pig enjoy wallowing, and are thought to have had semiaquatic ancestors. All mammals evolved first on land, so the distant ancestors of the dolphin and manatee must have been terrestrial and then semiaquatic, before becoming fully aquatic. Subcutaneous fat. Chimpanzees can accumulate visceral fat, which shows as a fat belly. In addition to visceral fat, humans have subcutaneous fat, directly attached beneath the skin over most of the body. Much like a wetsuit, it adds buoyancy and insulation. In aquatic mammals, and sometimes in obese humans, this fat is called blubber. Effusive sweat. Humans are the sweatiest mammals known. They have five times as many eccrine sweat glands as chimpanzees. In warm climates, humans can sweat up to 12 liters of fluid in a single day, yet have a low drinking capacity and must therefore stay near water sources. This cooling mechanism would not have evolved in a savannah environment. Seals in the sun sweat about as much as humans. Vernix-covered skin. Humans are often born with this greasy cheese-like substance covering much of the skin. It is otherwise only known on newborn seals. Baby fat. Human babies are born plump, with 16% body fat, mostly subcutaneous. Human milk has 25% more fat than chimpanzee milk, and babies quickly put on more fat after birth. Chimpanzees are born with only 3% body fat and stay lean. Baby back-floating technique. Babies can easily learn to roll over on their backs and float with their nose in the air. Their fat legs are buoyant. It was Paal Aagaard, NTNU colleague and baby-swimming instructor, who first alerted me to the aquatic ape hypothesis and asked if I could find a geological setting for it. Infant grasping reflex. Chimpanzee and human infants grab and hold tight when something is put into their hand. A chimpanzee infant is light and strong enough to hang from its mother’s fur. Human infants are too heavy and weak to hang in the air, but could float in water all day grasping the long scalp hair of parents and older siblings. Long oily scalp hair. An infant’s mother has long sebum-coated hair that floats. Sebaceous glands are mainly located on the face and scalp. The scalp is the highest point on the standing mother, while she wades in the water to gather food. Weak neck at birth. An infant chimpanzee’s neck, like other mammals, is strong enough to support the head. A baby’s neck is strong enough, if the birth takes place in water, and if the baby is kept in water for the first few months of life. Speech. Voluntary breath control, the ability to inhale a larger amount of air, and control the slow exhalation, is a precondition for human speech. Diving mammals have such breath control, whereas other mammals do not. Chimpanzees cannot be taught to say “aaaah,” even to receive a nice reward. Human speech has to do with breath control, not just with the brain. Dexterous hands. Thumb and finger evolution enable the precision grip or pincer grip, useful for picking bits of meat and shell from cracked shellfish. Chimpanzees pick up small things using their index finger and middle finger like tweezers. Mitochondrial DNA. Human mtDNA indicates that all living humans descended from a single female, called Mitochondrial Eve, only a few hundred thousand years ago. Chimpanzee mtDNA is about five times more variable, and indicates that their single female ancestor lived a few million years ago. It is currently thought that the most recent common ancestor of humans and chimpanzees lived about 5 million years ago, and that Mitochondrial Eve indicates a human population bottleneck. Alternatively, if human speciation took place on Bioko, Mitochondrial Eve could be Chimp Eve. Bioko is 32 kilometers offshore from areas populated by chimpanzees. Chimp Eve may have drifted to Bioko with the Guinea Current from one of the large rivers about 100 kilometers to the north. The trip must have taken many days. Bioko’s coastline is about 200 kilometers long, which is enough for many family groups to live separately. Individuals would share genes and evolving characteristics, but groups would be separate enough for some to survive a sickness that might wipe out the others. The evolving species could survive for tens of thousands of years, even if there were as few as a hundred individuals at any given time. A small population with a radically different habitat and diet is conducive to rapid evolution. The article continues under the illustration. Bioko rises above the shallow continental shelf, well situated for the peripatric speciation of humans . Illustration modified from Google Earth. Bioko has warm ocean water year round. Monthly averages vary between 25.9° and 29.3°. Ideal swimming pool temperatures are 26-31°, and young children need pool water of 29° or higher to not feel cold. A layer of insulating blubber would have increased chances of infant survival. Bioko is currently an island, but the continental shelf separating it from the mainland is only about 50 meters deep. The world’s sea level dropped more than 50 meters many times over the past 2.5 million years, due to the fluctuating continental glaciations. While the sea level was below −50 meters, Bioko was a peninsula, connected to the mainland. There is no other place in Africa that is comparable. The evolution from chimpanzee to semiaquatic human could have taken place during any of the island periods. When the sea-level drop reached −50 meters and Bioko became a peninsula, the newly evolved humans could have walked to the mainland. Sea-level estimations during the ice ages vary somewhat, as shown here by two of the available sea-level curves. Furthermore, the age of the earliest Homo sapiens is unknown. The reliable radiocarbon method cannot be used on fossils older than about 50,000 years. In the competition to claim the oldest fossils, some are now thought to be about 300,000 years. Older fossils may yet be found, or this old date may be spurious. It is not yet possible to suggest a time for the semiaquatic evolution and the appearance of Homo sapiens on mainland Africa. Unfortunately, there is no likelihood of finding any fossils on Bioko. A small number of mammals in a tropical climate, over a short geological time, in an erosional coastal area without sediment deposition, would not leave fossils. Even if intelligent humans left behind tools, markings, or interments, perhaps in a cave near the shore, that cave would probably be far below today’s sea level. There are no semiaquatic humans living now. It would probably not have been possible for semiaquatic and terrestrial humans to coexist. They would have different cultures, and in any violent conflicts, terrestrial humans would have all the advantages. Paleoanthropologists must not follow the example of the bishop’s wife. They should not let their orthodox beliefs keep a scientific theory of human evolution from becoming generally known and properly tested. The author Allan Krill is Professor at the Department of Geoscience and Petroleum, NTNU. Paleoanthropologists should not let their orthodox beliefs keep a scientific theory of human evolution from becoming generally known and properly tested. Women and men misunderstand each other’s signals of friendliness and sexual interest. But these misinterpretations are no surprise to evolutionary psychologists. Men are clearly more jealous of sexual infidelity than emotional infidelity. The opposite is true for women.